Oops. Long time no blog post. I had rather a wrist flare-up this week, after a change of meds made me manic enough to write nearly ten thousand words in one evening (after working for three hours, and immediately before reading an entire book and then not going to bed until 2am). It turns out I am definitely not healed enough for that — sometimes it feels like I’m not healed at all! But I am. I’m so much better than I was this time two years ago, when I was first dealing with having dodgy wrists, hands that couldn’t hold a pen and all. Two years ago I was either on or just about to go on tour with my local youth orchestra. We were going to Spain, and it wasn’t the best experience ever — the pain I was in, combined with the heat, and the fact that none of my close friends had gone on that tour so I didn’t have them to talk to, were all factors. Also, that was the week I read Catcher in the Rye, and that would have put me in a bad mood whatever everything else was like. Man, I hate that book so much. Anyway, let’s forget about the wrist injury for now and talk about more positive things. Today, we went to visit Castle Howard, which for those who have seen it, was used as the set for both the TV and the film adaptation of Brideshead Revisited. Now, I haven’t watched either of these. I also haven’t read the book, even though in my sister’s words, “everyone’s gay and it has a sad ending”. The film, I understand, featured both Ben Whishaw and Hayley Atwell, and I think they’re awesome. So yeah, I should really have acquainted myself with it sooner. But I guess my years of adamantly refusing to read anything that could be construed as a Classic meant I missed out on Evelyn Waugh, which just goes to show that my stubbornness wasn’t entirely beneficial. I skimmed past the exhibits that would have ruined the plot for me, and did my best just to enjoy the house and gardens in their own right. It wasn’t hard. They’re gorgeous. I’m sure my bookworm self would have been even more interested if I’d been able to connect them to characters and scenes, but as it was I just had to appreciate the beauty. Oh. And take selfies / artsy photos. Obligatory, really. Sitting on the Atlas Fountain. In the gift shop, I bought a copy of the book, so that I could fill this gap in my literary education (ha, I just typed ‘gay’ by accident because I’m using an unfamiliar keyboard. That too, I gather), and also because I only brought five books with me for this week away and I’ve read one of them already ;) I think the rest should tide me over, though: several of them are pretty long, and I do still have a novel to write. Because my ten thousand words the other day weren’t on Butterfly of Night‘s second draft, which I’d decided I was working on this month. Nope. That wasn’t going well: I was blocked, it wasn’t flowing, I couldn’t make the plot work and there were more holes everywhere I looked… so I decided to put it aside. And then I dug out my novel The Quiet Ones and had a look at it. This is a novel I planned to query last year, and didn’t. And then I planned to query it over Christmas. And didn’t. Reading through it, I remembered yet again why I lost my nerve: because I don’t like my own writing style in this book. Trying to be funny is really hard in third person, at least given the nature of the narrative. My decision to restructure the novel came from an unlikely source, though. 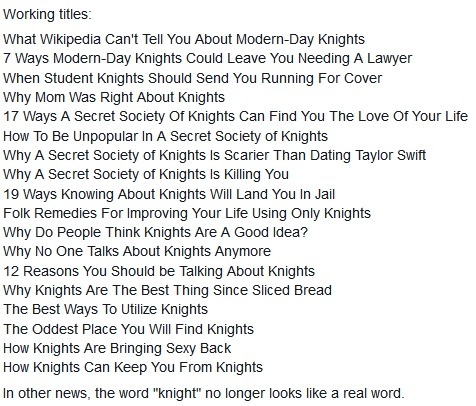 Running the word ‘knights’ through a title generator that gives you entertaining “clickbait” titles, I realised that almost all of them sounded funnier than what I was currently working with, and since the novel is full of sassy modern-day knights, I thought that might be what I wanted to aim for. Honestly, I kind of want to write all of these novels. That picture is playing up a bit for me, so if you can’t see it, it can also be found here. The title I decided on wasn’t directly taken from one of these, but it was inspired by them. So at the moment, I’m working on a book called Ten Reasons Every Knight Needs A Lawyer. It’s written in first person, unlike the other drafts. I’m keeping the plot the same, but the book still has to be totally rewritten, because every sentence needs to be altered to fit the new style. So far, it’s been enjoyable. I know it works. It makes Ani’s personality come across much more clearly, and allows me to make jokes in the narrative as well as the dialogue. I’m splitting the book into ten sections (each one is one of the reasons knights need lawyers), and then breaking up the chapters between them with small divisions rather than major chapter headers. I don’t know how it’s going to go, but that’s what I’m working on, when I’m not touring country houses, trying to buy a sword, or killing my hands. I’ll be back soon with more pictures from my exploits here in the north; in the meantime, let me know your thoughts on Brideshead Revisited, or your best folk remedies for improving your life using only knights. I’d be delighted to hear them.